Coordinator of the CoSiMa research project, 2013-2017. Initiator and chair of the annual Web Audio Conference (WAC), 2015. PhD (Doktor der Philosophie) at the University of Music and Dramatic Arts Graz, supervisor: Gerhard Eckel, 2013. DAAD Edgard Varèse Guest Professor for Electronic Music, TU Berlin 2007. 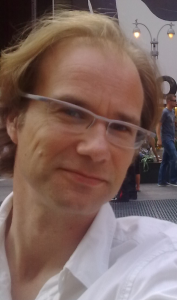 Head of the IRCAM Real-Time Musical Interactions and former Real-Time Applications team, 2002–2007. Chair of the 2006 International Conference on New Instruments for Musical Expression, NIME 06, 2006. Member of the NIME steering commitee, 2006–2011. Member of the IRCAM Real-Time Systems team, 1995–2002. Collaborator of the MusikLabor Wien, 1994–1995. Degree Diplom Ingenieur (Toningenieur) of the Technical University and the University of Music and Dramatic Arts Graz, 1996. Diplomarbeit at the AKG Acoustics Wien, 1994/95. Studio Assistant at the IEM, Institute for Electronic Music and Acousics Graz, 1990–1994. Studies at the University of Music and Dramatic Arts Graz, Music theory with Georg Friedrich Haas, Bernhard Lang and Gerd Kühr, 1990–1996. IAE, Interactive Audio Engine, C++ library, since 2011. MuBu, Multi-rate and multi-representation sound and movement description data container and visualization with audio analysis and synthesis operators, C/C++ library and modules, since 2009. PiPo, Programming Interface for Afferent Stream Processing Operators, C API and library, since 2013. Psychox, Real-time voice auto-tuning and harmonisation, C library, 2010. FTM & Co, Programming environment for real-time sound and movement analysis, modelling and synthesis (partially open source) integrated into Max/MSP, 2002-2010. SuperVP for Max/MSP, Advanced phase vocoder modules for high quality real-time sound transformation, C/C++ modules, 2008-2014. Other Max/MSP modules, Miscellaneous modules for sound analysis, re-synthesis and visualisation in the Max/MSP programming environment, C/C++ modules, 2002-2014. HARTIS, Real-time interactive car sound simulation system based on additive and granular synthesis for PSA Peugeot Citroën, Max/MSP application, 2004–2011. jMax and Max-FTS, Multi-platform Max-like open source programming environments, C/Java software, 1995–2002. Rapid-MIX, Real-time Adaptive Prototyping for Industrial Design of Multimodal Interactive eXpressive technology, 2015-2018. MusicBricks, Musical Building Blocks for Digital Makers and Content Creators, 2015-2016. SAME, Interactive mobile music applications, 2008-2010. I-MAESTRO, Multimodal analysis and feedback in music pedagogy, 2005-2008. Semantic HIFI, Real-time interactive content based audio processing, 2004-2006. CoSiMa (coordinator), Collaborative co-located mobile interactions based on web standards, 2013-2017. WAVE, Web Audio Visualization and Editing, 2013-2015. SampleOrchestrator2, Real-time interactive content based audio processing, 2011-2013. Interlude, Novel paradigms for expressive gestural exploration and interaction with digital musical content, 2008 -2010. Topophonie, Audio-graphic modelling and real-time interactive synthesis of sound textures, 2009-2012. SampleOrchestrator, Real-time interactive content based audio processing, 2006-2009. VoxStruments, Voice analysis for sound synthesis control, 2006-2009. 2PIM/MI3, Interactive multimodal programming platform for the meta-instrument, 2006-2009. Chloé × Ircam, Live-electronic concert with where the audience in invited to participate through performing with their smartphones, with Chloé, Benjamin Matuszewski, Sébastien Robaszkiewicz, and Jean-Philippe Lambert at the Festivals Fête de la Musique et Nuit Blanche Paris, 2015. Terminal, interactive audiovisual installation based on the sound materials and interaction design of the Chloé × Ircam concert, with Chloé, the Scale Collective, Benjamin Matuszewski, Sébastien Robaszkiewicz, and Jean-Philippe Lambert at the Festival Paris Musique Club at the Gaité Lyrique Paris, 2015/2016. Urban Musical Game, Installation of a musical ball game in public space, with Frédéric Bevilacqua, Nicolas Rasamimanana, Julien Blois, Jean-Louis Frechin, Uros Petrevski, and Andrea Cera and the Festivals Future en Seine and Agora IRCAM Paris, 2011. Sans Sous-Titre, Sound installation based on a database of speech recordings (people telling jokes) in all/any languages of the world, with Wolf Ka and Maryline Gillois, Paris 2011. MindBox, Audio-visual installation based on a gambling machine, with Christian Graupner and Roberto Zappala, Festival CynetArt Dresden, 2009, Festival Uva/Grapes Catania, Japan Media Arts Festival Tokyo, EMPAC Troy/New York, 2010. Cameleon Kaleidoscope, Piece for ensemble by Marco Antonio Suarez Cifuentes Development of real-time analysis/re-synthesis, Biennale Musiques en Scène Lyon, 2010. S0UNDB1TS, Sound installation for 578 independent elementary sound sources, with Robin Minard, Festival Inventionen Berlin, 2002. Maison de l’Ecluse, Sound installation in the framework of the Anamnesis event, with Antony Hequet and Antonella Bussanich, Chatillon sur Loire, 2000. Players – Twilight Zone, Concert and installation for 2 chess players, 3 musicians and 3 pinball players, with Peter Böhm, Uli Fussenegger and Corinne Schweitzer, Steirischer Herbst Graz, 1997. Narzissus, Opera by Beat Furrer, Development of real-time processing for time stretching and sound spatialisation, with Peter Böhm, Steirischer Herbst Graz, Salzburger Festspiele, Biennale di Venezia, 1994. S. Robaszkiewicz and N. Schnell, “Soundworks — A playground for artists and developers\\to create collaborative mobile web performances,” in Proceedings of the First International Web Audio Conference, 2015. J. Françoise, N. Schnell, R. Borghesi, and F. Bevilacqua, “Probabilistic Models for Designing Motion and Sound Relationships,” in Proceedings of the 2014 International Conference on New Interfaces for Musical Expression (NIME’14), 2014. J. Françoise, N. Schnell, R. Borghesi, and F. Bevilacqua, “MaD: Mapping by Demonstration for Continuous Sonification,” in ACM SIGGRAPH 2014 Emerging Technologies, Vancouver, Canada, 2014. B. Caramiaux, F. Bevilacqua, T. Bianco, N. Schnell, O. Houix, and P. Susini, “The Role of Sound Source Perception in Gestural Sound Description,” ACM Transactions on Applied Perception, vol. 11, iss. 1, pp. 1-19, 2014. J. Françoise, I. Lallemand, T. Artières, F. Bevilacqua, N. Schnell, and D. Schwarz, “Perspectives pour l’apprentissage interactif du couplage geste-son,” in Actes des Journées d’Informatique Musicale (JIM 2013), paris, France, 2013. J. Françoise, N. Schnell, and F. Bevilacqua, “A Multimodal Probabilistic Model for Gesture-based Control of Sound Synthesis,” in Proceedings of the 21st ACM international conference on Multimedia (MM’13), Barcelona, Spain, 2013. J. Françoise, N. Schnell, and F. Bevilacqua, “Gesture-based Control of Physical Modeling Sound Synthesis: a Mapping-by-Demonstration Approach,” in Proceedings of the 21st ACM international conference on Multimedia (MM’13), Barcelona, Spain, 2013. F. Bevilacqua, N. Schnell, N. Rasamimanana, J. Bloit, E. Fléty, B. Caramiaux, J. Françoise, and E. O. Boyer, “De-Mo: designing action-sound relationships with the mo interfaces,” in CHI’13, 2013, pp. 2907-2910. F. Bevilacqua, S. Fels, A. R. Jensenius, M. J. Lyons, N. Schnell, and A. Tanaka, “SIG NIME: music, technology, and human-computer interaction,” in CHI’13 EA on Human Factors in Computing Systems, 2013, pp. 2529-2532. F. Bevilacqua, A. Vanzandt-Escobar, N. Schnell, E. O. Boyer, N. Rasamimanana, S. Hanneton, and A. Roby-Brami, “Sonification of the Coordination of Arm Movements,” in Multisensory Motor Behavior: Impact of Sound, Hannover, Germany, 2013. M. Kimura, N. Rasamimanana, F. Bevilacqua, N. Schnell, B. Zamborlin, and E. Fléty, “Extracting Human Expression For Interactive Composition with the Augmented Violin,” in International Conference on New Interfaces for Musical Expression (NIME 2012), 2012. N. Rasamimanana, F. Bevilacqua, J. Bloit, N. Schnell, E. Fléty, A. Cera, U. Petrevski, and J. Frechin, “The urban musical game: using sport balls as musical interfaces,” in CHI EA ’12 Proceedings of the 2012 ACM annual conference on Human Factors in Computing Systems, 2012. B. Caramiaux, P. Susini, T. Bianco, F. Bevilacqua, O. Houix, N. Schnell, and N. Misdariis, “Gestural Embodiment of Environmental Sounds: an Experimental Study,” in New Interfaces for Musical Expression (NIME), 2011. B. Caramiaux, F. Bevilacqua, and N. Schnell, “Sound Selection by Gestures,” in New Interfaces for Musical Expression (NIME), 2011. N. Schnell, F. Bevilacqua, F. Guédy, and N. Rasamimanana, “Playing and Replaying – Sound, Gesture and Music Analysis and Re-Synthesis for the Interactive Control and Re-Embodiment of Recorded Music,” in Klang und Begriff: Gemessene Interpretation – Computergestützte Aufführungsanalyse im Kreuzverhör der Disziplinen, S. W. Heinz von Loesch, Ed., Mainz, Allemagne: Schott Verlag, 2011. N. Schnell, F. Bevilacqua, N. Rasamimanana, J. Bloit, F. Guédy, and E. Fléty, “Playing the MO – Gestural Control and Re-Embodiment of Recorded Sound and Music,” in NIME, Oslo, Norvege, 2011. F. Bevilacqua, N. Schnell, and S. Fdili Alaoui, “Gesture capture: Paradigms in interactive music/dance systems,” in Emerging Bodies, G. Klein and S. Noeth, Eds., transcript Verlag, 2011, pp. 183-193. F. Bevilacqua, N. Schnell, N. Rasamimanana, B. Zamborlin, and F. Guédy, “Online Gesture Analysis and Control of Audio Processing,” in Musical Robots and Interactive Multimodal Systems: Springer Tracts in Advanced Robotics Vol 74, J. Solis and K. C. Ng, Eds., Springer Verlag, 2011, pp. 127-142. N. Rasamimanana, F. Bevilacqua, N. Schnell, F. Guédy, C. Maestracci, E. Fléty, B. Zamborlin, U. Petrevsky, and J. Frechin, “Modular Musical Objects Towards Embodied Control Of Digital Music,” in Tangible Embedded and Embodied Interaction, 2011. B. Caramiaux, F. Bevilacqua, and N. Schnell, “Towards a Gesture-Sound Cross-Modal Analysis,” in Gesture in Embodied Communication and Human-Computer Interaction: LNAI 5934, Springer Verlag, 2010, pp. 158-170. B. Caramiaux, F. Bevilacqua, and N. Schnell, “Study on Gesture-Sound Similarity,” in Music and Gesture, Montreal, Canada, 2010. B. Caramiaux, F. Bevilacqua, and N. Schnell, “Analysing Gesture and Sound Similarities with a HMM-based Divergence Measure,” in Sound and Music Computing (SMC2010), 2010. B. Caramiaux, F. Bevilacqua, B. Zamborlin, and N. Schnell, “Mimicking Sound with Gesture as Interaction Paradigm,” 2010. B. Caramiaux, F. Bevilacqua, and N. Schnell, “Analysing Gesture and Sound Similarities with a HMM-based Divergence Measure,” in Sound and Music Computing, Barcelona, Spain, 2010. N. Schnell, M. A. Suárez Cifuentes, and J. Lambert, “First Steps in Relaxed Real-Time Typo-Morphological Audio Analysis/Synthesis,” in Sound and Music Computing, Barcelone, Spain, 2010. D. Schwarz and N. Schnell, “Descriptor-based Sound Texture Sampling,” in Sound and Music Computing (SMC), Barcelona, Spain, 2010, pp. 510-515. D. Schwarz and N. Schnell, “A Modular Sound Descriptor Analysis Framework for Relaxed-real-time Applications,” in International Computer Music Conference (ICMC), New York, USA, 2010. F. Bevilacqua, B. Zamborlin, A. Sypniewski, N. Schnell, F. Guédy, and N. Rasamimanana, “Continuous realtime gesture following and recognition,” in Gesture in Embodied Communication and Human-Computer Interaction: Lecture Notes in Computer Science (LNCS) volume 5934, Springer Verlag, 2010, pp. 73-84. F. Bevilacqua, B. Zamborlin, N. Rasamimanana, and N. Schnell, “Contrôle gestuel continu de médias sonores et visuels,” in Forum on tactile and gestural interaction, Lille, France, 2010. B. Caramiaux and N. Schnell, “Towards an Analysis Tool for Gesture/Sound Mapping,” in Gesture Workshop, Bielefeld, Germany, 2009. B. Caramiaux and N. Schnell, “Similarity Measures between Gesture and Sound,” in The International Summer School in Systematic, Comparative and Cognitive Musicology, Jyväskylä, Finland, 2009. N. Schnell, A. Röbel, D. Schwarz, G. Peeters, and R. Borghesi, “MuBu & Friends – &#8232;Assembling Tools for Content Based Real-Time Interactive Audio Processing in Max/MSP,” in ICMC, Montreal, 2009. D. Schwarz, N. Schnell, and S. Gulluni, “Scalability in Content-Based Navigation of Sound Databases,” in International Computer Music Conference (ICMC), Montreal, Canada, 2009. D. Schwarz and N. Schnell, “Sound Search by Content-Based Navigation in Large Databases,” in Sound and Music Computing (SMC), Porto, Portugal, 2009. F. Bevilacqua, B. Zamborlin, A. Sypniewski, N. Schnell, and F. Guédy, “Continuous realtime gesture following and recognition,” in The 8th International Gesture Workshop, 2009. T. Grosshauser, D. Schwarz, and N. Schnell, “Seeing the Inaudible : Descriptors for generating objective and reproducible data in real-time for musical instrument playing standard situations,” in Audio Engineering Society Convention (AES), Amsterdam, The Netherlands, 2008. D. Schwarz, S. Cadars, and N. Schnell, “What Next? Continuation in Real-Time Corpus-Based Concatenative Synthesis,” in International Computer Music Conference (ICMC), Belfast, UK, 2008. N. Rasamimanana, F. Guédy, N. Schnell, J. Lambert, and F. Bevilacqua, “Three Pedagogical Scenarios using the Sound and Gesture Lab,” in 4th i-Maestro Workshop on Technology Enhanced Music Education, 2008. F. Guédy, N. Leroy, F. Bevilacqua, T. Grosshauser, and N. Schnell, “Pedagogical experimentation using the Sound and Gesture Lab,” in 3rd i-Maestro Workshop on Technology-Enhanced Music Education, Barcelone, Espagne, 2007. F. Bevilacqua, F. Guédy, E. Fléty, N. Leroy, and N. Schnell, “Wireless sensor interface and gesture-follower for music pedagogy,” in International Conference on New Interfaces for Musical Expression, New York, USA, 2007. A. Cont, D. Schwarz, N. Schnell, and C. Raphael, “Evaluation of Real-Time Audio-to-Score Alignment,” in International Conference on Music Information Retrieval (ISMIR), Vienna, Austria, 2007, pp. 315-316. N. Schnell, F. Bevilacqua, D. Schwarz, N. Rasamimanana, and F. Guédy, “Technology and Paradigms to Support the Learning of Music Performance,” in 2nd i-Maestro Workshop on Technology Enhanced Music Education, Leeds, Royaumes Unis, 2006. N. Schnell, D. Schwarz, and R. Müller, “X-Micks – Interactive Content Based Real-Time Audio Processing,” in 9th International Conference on Digital Audio Effects (DAFx-06), Montreal, Canada, 2006. F. Bevilacqua, N. Rasamimanana, and N. Schnell, “Interfaces gestuelles, captation du mouvement et création artistique,” in L’inouï #2: Revue de l’Ircam, Editions Léo Scheer, 2006. N. Schnell, R. Borghesi, D. Schwarz, F. Bevilacqua, and R. Müller, “FTM — Complex data structures for Max,” in International Computer Music Conference (ICMC), Barcelona, Spain, 2005. N. Schnell and D. Schwarz, “Gabor, Multi-Representation Real-Time Analysis/Synthesis,” in COST-G6 Conference on Digital Audio Effects (DAFx), Madrid, Spain, 2005, pp. 122-126. D. Schwarz, A. Cont, and N. Schnell, “From Boulez to Ballads: Training Ircam’s Score Follower,” in International Computer Music Conference (ICMC), Barcelona, Spain, 2005. F. Bevilacqua, R. Müller, and N. Schnell, “MnM: a Max/MSP mapping toolbox,” in New Interfaces for Musical Expression, Vancouver, 2005, pp. 85-88. A. Cont, D. Schwarz, and N. Schnell, “Training Ircam’s Score Follower,” in IEEE International Conference on Acoustics, Speech, and Signal Processing, Philadelphia, USA, 2005. D. Schwarz, N. Orio, and N. Schnell, “Robust Polyphonic Midi Score Following with Hidden Markov Models,” in International Computer Music Conference (ICMC), Miami, USA, 2004. A. Cont, D. Schwarz, and N. Schnell, “Implicit Learning of Musical Performance Parameters : Training Ircam’s Score Follower,” in AAAI Symposium 2004 Style and Meaning in Language, Art, Music, and Design, Washington, USA, 2004. N. Orio, S. Lemouton, D. Schwarz, and N. Schnell, “Score Following: State of the Art and New Developments,” in New Interfaces for Musical Expression (NIME), Montreal, Canada, 2003. N. Schnell and M. Battier, “Introducing Composed Instruments : Technical and Musicological Implications,” in International Conference on New Interfaces for Musical Expression (NIME 2002), Dublin, Ireland, 2002. N. Schnell, G. Peeters, S. Lemouton, P. Manoury, X. Rodet, “Synthesizing a choir in real-time using Pitch Synchronous Overlap Add (PSOLA) “, International Computer Music Conference (ICMC), Berlin, September 2000. F. Déchelle, R. Borghesi, N. Orio, N. Schnell, “The jMax environment: an overview of new features”, International Computer Music Conference (ICMC), Berlin, September 2000. R. Bargar, F. Déchelle, I. Choi, A. Betts, C. Goudeseune, N. Schnell, W. Olivier, “Coney Island, combining JMax, Spat and VSS for Acoustic Integration of spatial and temporal models in a virtual reality installation”, International Computer Music Conference (ICMC), San Francisco, 2000. M. M. Wanderley, N. Orio, N. Schnell, “Towards an analysis of interaction in sound generating systems”, International Symposium on Electronic Arts (ISEA), Paris, December 2000. F. Iovino, N. Schnell, O. Lartillot, “Modalys in jMax, real-time modal-synthesis”, International Computer Music Conference (ICMC), Beijing, October 1999. F. Déchelle, M. de Cecco, E. Maggi, N. Schnell, “jMax recent developments”, International Computer Music Conference (ICMC), Pekin, September 1999. F. Déchelle, R. Borghesi, M. de Cecco, E. Maggi, J. B. Rovan, N. Schnell, “jMax: An Environment for Real-Time Musical Applications”, Computer Music Journal, vol. 23, n° 3, p. 50-58, September 1999. F. Déchelle, R. Borghesi, M. de Cecco, E. Maggi, J. B. Rovan, N. Schnell, “jMax: a new JAVA-based editing and control system for real-time musical applications”, International Computer Music Conference (ICMC), Ann Arbor, October 1998. M. M. Wanderley, N. Schnell, J. B. Rovan, “ESCHER – Modeling and Performing Composed Instruments in real-time”, IEEE International Conference on Systems Man and Cybernetics, San Diego – CA, October 1998. F. Déchelle, R. Borghesi, M. de Cecco, E. Maggi, J. B. Rovan, N. Schnell, “jMax: demonstration of an integrated environment for real time musical applications”, International Computer Music Conference (ICMC), Ann Arbor, October 1998. F. Déchelle, R. Borghesi, M. de Cecco, E. Maggi, J. B. Rovan, N. Schnell, “Latest evolutions of the FTS real-time engine, typing, scoping, threading, compiling”, International Computer Music Conference (ICMC), Ann Arbor, October 1998. F. Déchelle, M. de Cecco, E. Maggi, N. Schnell, “New DSP applications on FTS”, International Computer Music Conference (ICMC), Hong Kong, 1996. N. Schnell, “GRAINY – Granularsynthese in Echtzeit: Eine Objekt-Sammlung für Max auf der ISPW”, Beiträge zur Elektronischen Musik, BEM 4, Beiträge zur Elektronischen Musik, IEM Graz 1994.